The number one reason members do not stick with a CSA is what I call food guilt – there’s too much stuff and they don’t get through it all. I’ve found that folks feel quite differntly about produce that comes through a CSA than they get at the grocery store. We always have a portion of produce form the store go bad, but we still keep buying stuff there – for example, we’ve maybe eaten about 50% of the avocados we’ve puchased at the store in our lifetime before they went bad. At the farm, to minimize this sitution where members may find themselves overwhelmed with produce they can’t eat in time, we carefully think through the box each week. We try to give a variety in good-sized proportions – enough of each crop so you can use it in a recipe, but not so much that it’s a burden. On variety we also try to do about 80% of staple crops like onions and tomatoes and only 20% “different” things like fennel or Asian greens. Part of the excitement of the CSA is receive something you haven’t eaten before, but too much bok choy makes somes members think this whole CSA deal is crazy. It’s always hard to know which crops will push people over the edge. I’ve had members ask for about ten times the amount of fennel is a season and others give me a look like “are you kidding me…I eat this bulb which smells like licorice?” A tough balancing act at times. The real key to making CSA work, however, is getting into the groove of eating in season and being a flexible cook. Everybody cooks differently, sure, but if you’re searching for a magic recipe which uses a bunch of the crops in the box, you could drive yourself nuts. Instead, I always go off script and think of ways of preparing the veggie as simply as possible. Especially in the summer, dressing veggies with vinegar and oil to eat raw or grilling/sauteeing veggies with just salt and pepper seasoning makes for great grazing in the evening. Melon: Most get a canteloupe, but I had to substitute in a watermelon in some boxes. Yellow Onions: These are not sweet like we’ve done in the box to date, but cooking onions. Hakurai Summer Turnips: Yes, they look like racquet-ball sized radishes, but these are turnips. Really sweet and smooth. Simply peel and slice these and eat with some salt. You could shred with carrots or cabbage and make a slaw – add sugar and rice vinegar. A Little Basil: I included this if you want to do the eggplan recipe in the video. There are a bunch of recipes like this. We find this a verstatile dish which lends itself to combining the eggplant with a lot of other veggies in season. Sprinkle both sides of eggplant rounds generously with salt; place on baking sheet for 15 minutes to draw out moisture. Use paper towels to blot moisture from each side of the eggplant slices. Sprinkle lightly with salt and pepper. Whisk eggs in a shallow bowl. Place panko bread crumbs in a second bowl. Dip each side of the eggplant slices in the whisked eggs, then press into the panko crumbs to coat each side. Place slices on a cooling rack on a baking sheet. Spray the tops of eggplant generously with cooking spray. Bake 8 minutes in preheated oven. Turn each slice, and spray the other side with cooking spray. Bake an additional 8 to 10 minutes. Remove from oven and let cool slightly. Make stacks by putting slice of mozzarella and leaf of basil between eggplant. You can put a slice of tomato in your stack too, or cover with spaghetti sauce and top with some olive oil…whatever you’re in the mood for. We typically serve a stack with three eggplant slices for each person. I haven’t written yet about the new member of the family since she was born about six weeks ago now. 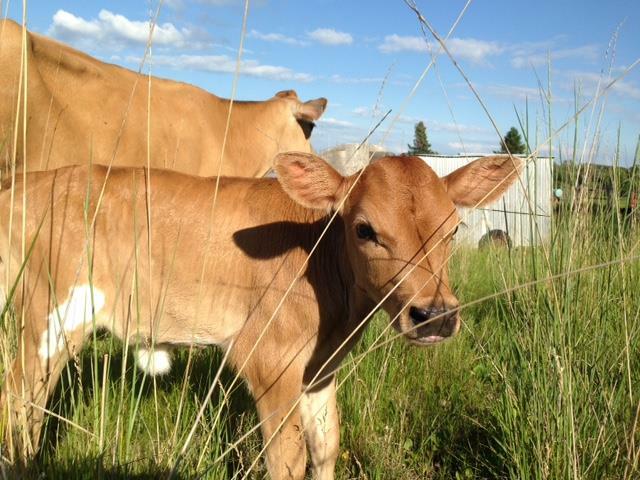 Meet Juneberry the heifer calf. Years ago this farm saw many a calf born each year when the Kratzke family (who we bought the farm from) ran a dairy operation. But that was a long time ago now. 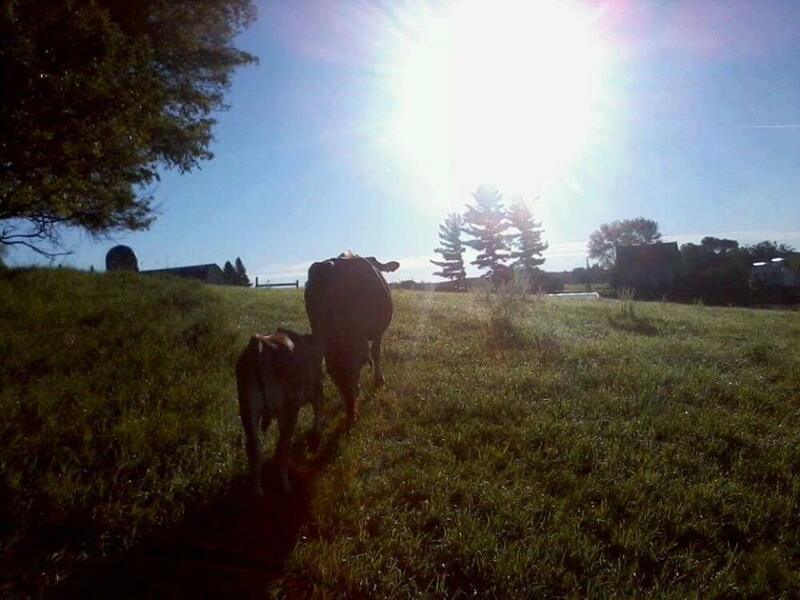 To the best of my knowledge this is the first calf born here since the 1970’s….that’s pretty exciting after such a long stretch. Oranos Pepper and Anaheim: The orange one is sweet, the green anaheim is hot. Lemon Balm: Yes, this is the weed-looking thing on the top of the box. Think of using in your lemonade or suntea – also nice laid over a baked chicken or fish. Watermelon: Some got a yellow variety, some an orange variety. Leave a comment Baby Cows! It all feels a little out of control this time of year. Besides the CSA and my full-time dayjob, we just keep running to keep up with thre farm stands (one at Essentia in Detroit Lakes and Falls Baking Co in Fergus Falls plus the 24/7 one at then end our our driveway) and supplying the farmers market on Saturdays. It’s kind of constant harvesting. Friday Morning: Maree and Ryan pick corn, tomatoes, eggplant, carrots (4.5 hours). Friday Afternoon: Mix cherry tomatoes, wash produce and pack boxes (3 hours). Ryan and Maree deliver boxes to members (2.5 hours each). After getting home, we start on farmers market (6 pm – 11:30)….wake up and go again. Carrots: Wow, this has not been my year on carrots….Maree and I scrounged around the bed for a few hours to get these. Live Wide Open – Lida Farm from H2M on Vimeo. Sweet Corn: A mix of the Trinity bi-color which is coming in and the early yellow Sugarbuns which is going out of season. Fennel: Green stalk thing on top of the box. Check out this recipe from the Spendid Table http://www.splendidtable.org/recipes/roasted-beet-fennel-and-citrus-salad You will have to adjust a bit since there’s a single fennel bulb. Mix of Regular Tomatoes: There’s getting to be a fair amount of ripening out there. Everybody got some red tomatoes plus some yellow romas or orange blossom for some color.